Review: Balmuda The Toaster - Safer Reviews, Unbiased & Independent Reviews. Beauty and consistency in a toaster. Helps preserve the moisture in whatever you’re toasting. It’s whimsical and cute, which is a good thing. It’s not yet available in the US, and if you do get your hands on one, caveat emptor; you’re an ocean away from customer support or a valid warranty. I’d done some research on toasters a year prior and found the industry to be something of a confused sea: neither the brand nor the amount of money—from dirt-cheap to ludicrous—spent on a toaster guaranteed quality. It’s also not a space rife with innovation. The toasters we’re using today and the ones manufactured a generation ago are pretty similar, though the ones we’re using now tend to be chintzier. Toaster ovens are their own special category separate from traditional slot toasters, and, thanks in large part to the distance between the heat source and the toast itself, they’re not renowned for making great toast. In fact, toaster-oven toast tends to be dried-out toast. 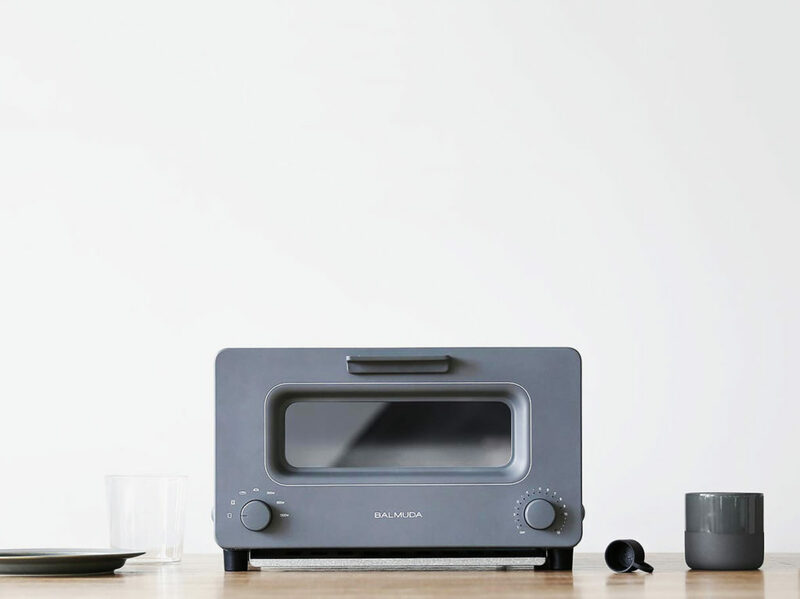 This one, dubbed Balmuda The Toaster (about $220), seemed like it should be lumped in the toaster oven category, but Gregory’s subject line nagged at me. I also watched a video where, before toasting, water is poured into a slot into the top of the oven before toasting, effectively converting the Balmuda into a mini steam oven, a hack designed to keep what’s being cooked from drying out. Getting my hands on one required some effort. I emailed Gregory, who lives in Seoul, and asked if he could contact Balmuda and get them to send a unit my way. Akin to vacuum manufacturer Dyson, Balmuda the company is known in Japan for creating design-forward items like fans, air filters, and electric heaters. One week later, the thing arrived looking like an upscale appliance from the Apple Store on Tatooine. It was surprisingly beautiful and more than a little bit cute. What really stuck out was the itty-bitty plastic mug that looked like it was pimped from a Holly Hobbie Oven set. I poured the water in a trap door in the top of the machine and watched the water reappear in a built-in slot in the front of the toaster. Did I mention that all of the instructions were in Korean and Japanese or that I read neither? No matter. There were plenty of pictures and online videos and someone in Korea had handwritten helpful things like “toast,” “cheese toast,” and “croissant” next to their pictures in the manual. (There are also straight-up oven settings, but those aren’t going to drive a purchase decision on this device.) I plugged the machine in, put in some lovely croissants and twisted the timer dial to get things going. The timer sang a happy little tick-tick-tick as it counted down and made a “Ta-Da!” sound when it was done. When I tried to heat the croissants, lights around the dial blinked and indicated things should have been happening inside, but when I peered in the window, I noticed a particular lack of toaster glow. The croissants emerged warm but not hot and the water level was unchanged. Toward the end of the cycle, the steam stops and there’s a burst of power to the heating elements, giving the bread a last-moment nudge toward toasty perfection. Two days later, an incredibly heavy box arrived on my doorstep. Nested inside were two more boxes, each one smaller and somehow heavier feeling. Finally, I pulled out a car-battery sized transformer. Intense in its ugliness, it cast the odor of uncured plastic in a five-foot radius around it. A yin to Balmuda’s cute yang, it nevertheless got the toaster working. I’d bought a loaf of shokupan, a sort of extra-thick Wonder Bread cousin that’s really, really big in Japan. I put two slices inside the Balmuda, selected the toast setting and turned the timer to four minutes. The top and bottom heating elements alternated on and off, as if saying hello to one another. Steam emerged from little vents in the side of the door. I opened the door to toast that was evenly browned on both sides, save for the thin white strips on one side where the oven grate blocked the bottom element’s radiant heat. I pulled out the butter and my friend Rene’s “Just Peachy” jam. For a little while my wife Elisabeth and I just reveled in toasty goodness. Only toward the end of my slice did I stop to think that I should be a bit more scientific in my carbo loading. I grabbed my trusty red Cuisinart Metal Classic 4-Slice Toaster and did a two-unit head-to-head shokupan toast-off. Honestly, the toast they produced wasn’t incredibly different. The Balmuda took a whisker longer to get to the same degree of doneness, but the evenness of toasting, particularly comparing sides of the same piece of toast was more consistent. I also noted a bit more tender chewiness in the Balmuda slice. There’s innovation under Balmuda’s hood, but after you’ve poured the water in the slot, it’s familiar. Set the mode: toast, cheese toast, croissant, or French bread, twist the timer to your preferred time, and it starts counting down. On toast mode, the heating elements come on: top, bottom, top, bottom, alternating their way up to an oven temperature of about 320 degrees Fahrenheit, and holding steady there through the middle portion of the cooking, warming the bread until, as the Japanese-to-English Google Translate suggests, the exterior “takes on the color of a fox.” Toward the end of the cycle, the steam stops and there’s a burst of power to the heating elements, giving the bread a last-moment nudge toward toasty perfection. In my tests, I found that the middle “fox” phase was really like the “get the bread hot and steamy” phase, and the blast at the end created the majority of the nice caramelization. The taleggio melted through, going ever so slightly bubbly while the top of it started browning. The top edges of the bread took on a lovely dark crispiness. As for the other settings, cheese toast concentrates more heat on the top of the bread, croissant mode warms it throughout with only a short crisping-heat blast at the end. French bread mode leaves the crisping out completely. One person I’ve talked to waxed about how impressive the steam is for resuscitating stale bread or croissants. While true, it feels peculiar to recommend purchasing something for its capacity to refresh bakery items from the day-old bin. Next, I swapped the shukopan for a loaf of fresh-sliced sourdough from Seattle’s James Beard-nominated Columbia City Bakery. The bread had a lovely soft, springy texture and an appealing tackiness. Here, the differences were more apparent. Again, there was the pleasing chewiness in the Balmuda slice, while bread pulled from the traditional toaster leaned toward a cracker-like crispness at the edges. What I realized with these slices was that the Balmuda’s magic was that it preserved more of the bread’s original springiness, encasing it in a crisp exterior, while the traditional toaster’s work felt more subtractive, trading moisture for crunchiness. Regardless of the machine, the slices were so good that I forgot to butter them. My previous toaster research had led me to toaster repairman Michael Sheafe who had counseled the “second batch test,” which boils down to checking for consistency between the first and second batches of toast. Cheap toasters inevitably give inconsistent results, as the first batch is a cold start and the second begins with a hot machine, but in my tests, the Balmuda was impressively consistent. A day later, I bought a hunk of taleggio from the supermarket, cut it into thick slices which I set on the sourdough, switched the dial to cheese bread mode and turned it on. The taleggio melted through, going ever so slightly bubbly while the top of it started browning. The top edges of the bread took on a lovely dark crispiness. While it didn’t feel like some sort of technical miracle of toast, it did remind me of some of the best things about fondue. It got me thinking about what we like about toast and how much of it is based on texture. We want a pillowy interior, an exterior so crispy that it’s audible when bitten through, and some satisfying chewiness. The Balmuda works on accentuating and preserving these qualities. It’s some pretty good thinking, cleverness that in my book qualifies this toaster in the “smart kitchen” category, even though it doesnt need an app. Is it so good that it’s going to make you want to bring your existing toaster to Goodwill and take the plunge? No. Not quite. Are you going to think twice about plunking down more than $200 if it ever comes out in the United States? Yes you are. Then again, you could plunk down that much anyway; the clear-sided, quartz-heated Magimix by Robot-Coupe Vision Toaster, a critical favorite, is $250. The thing that really pushes me over the edge to where I’d think about it once my Cuisinart kicks the bucket, is that unlike so much other stuff out there, the Balmuda makes me happy. There’s the way it resembles an artist’s prototype, good-looking enough that I stuck it on a bookshelf one night when my wife and I had company because I wanted it to be a conversation piece. I like the tick-tock of the timer and the ta-da! when it’s done. There are also the little curls of steam that waft out of vents in either side of the door. There’s that goofy feeling you get when you catch yourself watching the elements go on and off, literally watching your toast… toast. That said, as a food writer, restaurant critic, and a cookbook author, I’m constantly looking for the little things that turn the quality up a whisker, quietly transforming a good meal into a memorable one. What this can be is always a variable: farm-fresh ingredients, tasting and seasoning at every step of the cooking process, the use of fat and acidity to heighten flavors, or attention to texture, to name a few. Is Balmuda The Toaster the perfect toaster? That depends on you. Is something better because it brings you a bit of joy when you use it or just look at it? It’s a slippery slope. Saying something makes you happy when you use it could lead to people putting Hello Kitty stickers on the steering wheels of their 16-year old Subarus and expecting their day to get better. Then again, considering how well the Balmuda works, maybe it will. Update: This headline of this article was changed to note the fact that the toaster is made in Japan.